France's high-speed train service is known as the TGV. In 2007 a TGV test train set the record for the fastest wheeled train by reaching a speed of 357.2 mph (574.8 km/h). 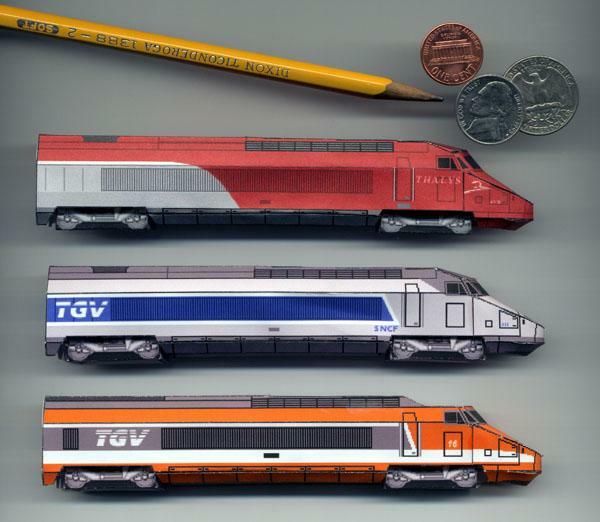 These mini papercraft models of TGV trains show some of the various paint schemes the trains sport. Free downloads of the templates for these and many other TGV trains are available from TGVweb. 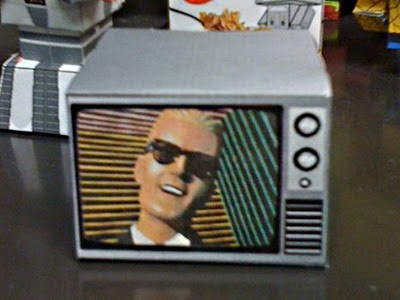 Every once in a while it is nice to build a mindlessly simple papercraft and this Max Headroom TV set papercraft fills the bill. ^^ It is just a simple box based on the Cubee template, no glue required. Max Headroom is the lead character in the late 80's science fiction television show of the same name. Max is probably best known for his appearances as the spokesman in television commercials for "New Coke". The template for this papercraft TV was created by 7ater and may be downloaded here. Late last year Square Enix celebrated the release of its Front Mission Evolved video game. 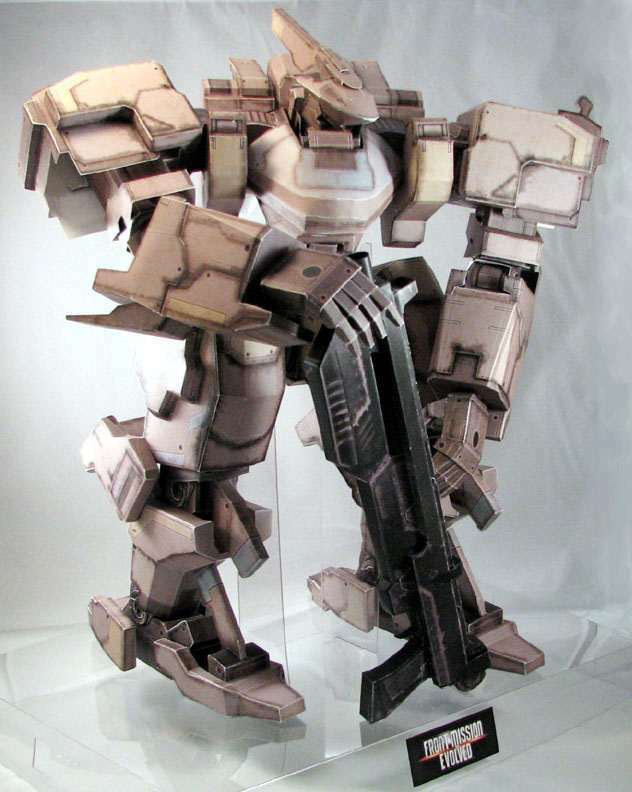 This Zephyr mech paper model was released as part of the celebration. Standing at a height of 12.5" (31.8 cm), the model can be posed with 40 different joints. Various accessories come with the Zephyr template including a machine gun, shot gun, a grenade and a shield. The photo above is from the designers of the papercraft, 3Dpaper. A download of the template is available at the Square Enix website here. Look for the link labeled "fully colored model" near the bottom of the page. Sorry, the contest to color your own Zephyr mech mentioned on the page is over, but a blank template is still available if you want to give it a try. This is the first of numerous Kingdom Hearts 2 treasure chest paper models I hope to release over the course of the coming year. 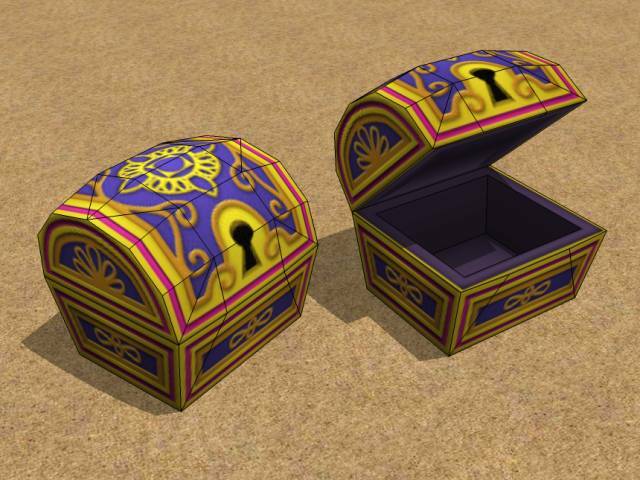 In the KH2 video game there are both large and small treasure chests to be found. This large treasure chest (which I call the "Aladdin treasure chest") can be found in the Agrabah area, a location taken from the Disney movie, Aladdin. The finished papercraft model of the treasure chest measures 3" L x 2.75" W x 3" H (7.6 cm x 7 cm x 7.6 cm). I found when I did my test build that the model was sturdy enough to maybe be used as a gift box (for something really small like a piece of jewelry). The image above is a 3D render to show the textures on the inside and outside of the chest. A download of the two page, six piece template is located here. In the 1960's automotive designer Carroll Shelby teamed with the Ford Motor Company to produce high performance Mustangs with the labels "GT350" and "GT500". These "Shelby Mustangs" ended production in 1970. It wasn't until 2007 that Shelby and Ford teamed again to produce a car with the GT500 label. 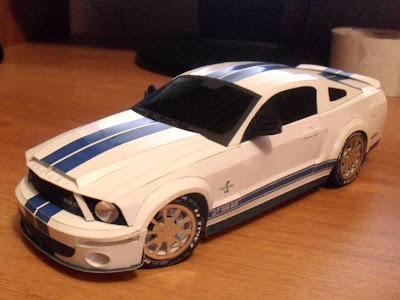 This detailed paper model is of a 2008 Mustang GT500. A download of the papercraft template is available here. MarianoDG from imprime-recorata-pega.com has created another detailed comic book character papercraft! 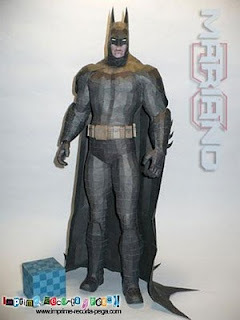 Mariano lists the difficulty of this Batman Papercraft at "hard" but notes that "it is not as hard as it looks". ^^ All the previous superhero papercraft models I have seen from Mariano have been Marvel Comics characters. So unless I missed one, this may be his first paper model of a DC Comics character. Batman, along with Superman and Wonder Woman, is one of the most popular characters in the DC Comics Universe. A download for this papercraft is available here. Here is another another papercraft from the ever popular Studio Ghibli animated movie, My Neighbor Totoro. In the movie two young Japanese girls encounter three "forest spirits" known as Totoros. 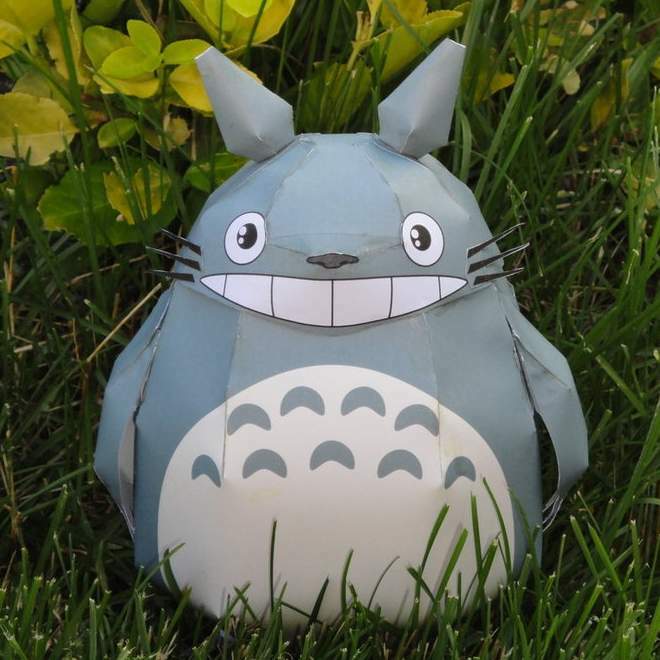 This papercraft is of the largest Totoro of the three. DeviantART member Studioofmm created this papercraft in 2010. A copy of the four page template for the Totoro is posted here. 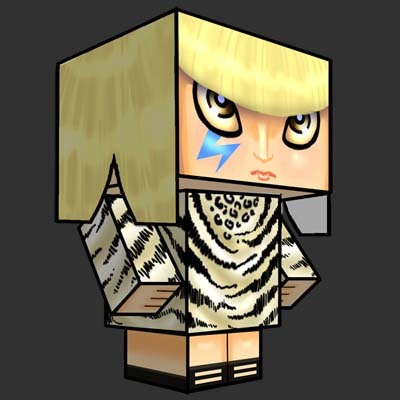 This cubee paper toy shows recording artist Lady Gaga in the costume she wore in the music video for the song Just Dance. Just Dance was the hit single that began Gaga's rise to stardom. This custom cubee is the work of 'Yamino at DeviantART. A download of the template is available here. Here is another great papercraft from the world of miniature gaming: a High Elf tower. There are several nice things about this tower model. First, the roof is removable. Next, it is constructed so that the interior has as much color and detail as the outside of the tower. Finally, the window shutters can actually be opened and closed. 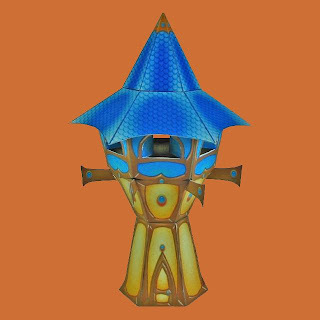 A free download of the template for the tower is available here. I got the urge to create another papercraft from the Tron:Legacy movie. 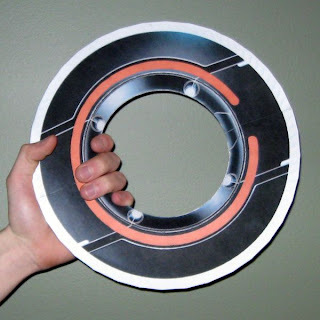 ^^ This is the identity disc of Rinzler. Rinzler is bad guy Clu's top enforcer and apparently the only program capable of wielding two identity discs in battle (see animation below). Like my earlier Sam's Identity Disc papercraft, this is a tough one to build. Lined and unlined templates are available here. A build of the unlined template constructed without folds is shown in the photo above. 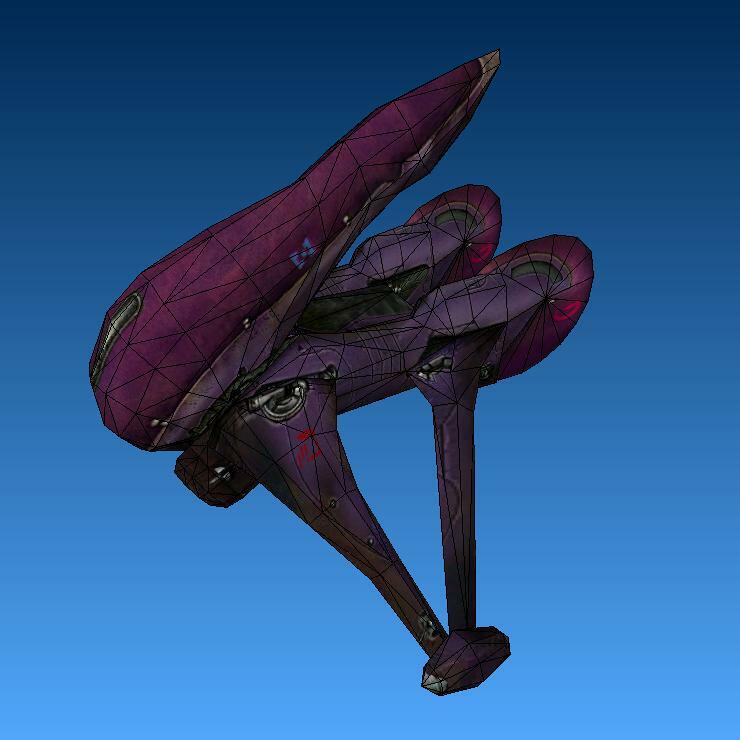 The Banshee (also known as a Type-26 Ground Support Aircraft) is an aerial assault craft appearing in the Halo series of video games. The Banshee is part of the arsenal of the Covenant Empire which has been described as "a religious hegemony of multiple alien species". 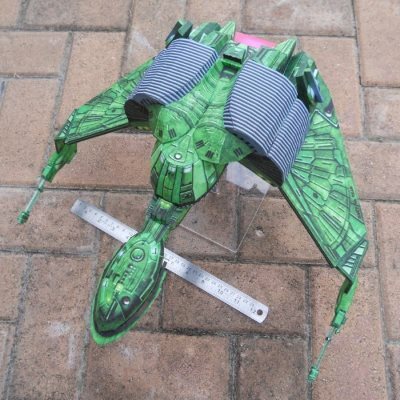 This papercraft Banshee is the work of Brandon (aka z8-0) at DeviantART and may be downloaded here. 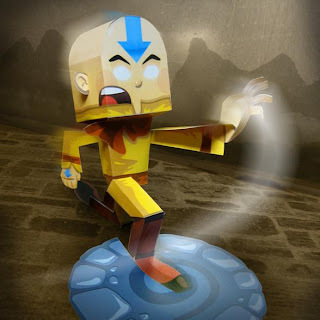 Illustrator Keith Allen calls his paper model of Aang the Last Airbender a "paper sculpture". 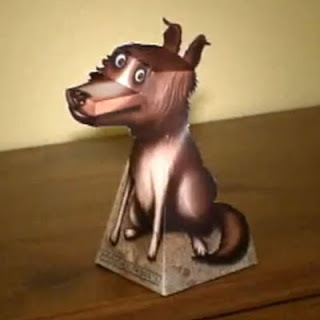 The unique thing about this particular papercraft is it built from a single piece of paper (i.e. the template has only one part). Aang, of course, is the main character in the animated television series, Avatar: The Last Airbender. A copy of the template in .png format is posted here.